When you arrived in Hiroshima, you notice that the city is very modern and new that is because it was largely destroyed by an atomic bomb during World World II and now the buildings & streets are all newly rebuilt. 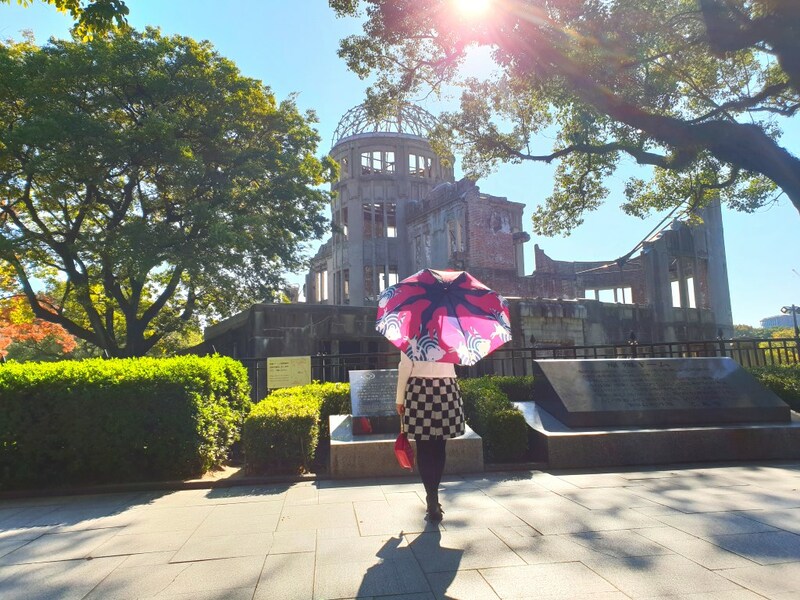 One of the top attractions to visit in Hiroshima is the ruins of Genbaku Dome also known as the Atomic Bomb Dome. The ruin is the symbol of Hiroshima city, a UNESCO World Heritage site in 1996. Highly recommend anyone who is visiting Hiroshima to pay a visit to this peaceful park. You cannot miss out of this place while in Hiroshima, else you missed out the most important portion of Hiroshima. Let’s dig some history of this city – On 6th August, the first atomic bomb in human history was dropped on Hiroshima during the final stage of World Wall II. The American dropped two nuclear weapons over the Japanese cities; Hiroshima & 3 days later at Nagasaki in 1945. Over 90% of the city was wiped out and killed 80,000 people and later tens of thousands more die of radiation exposure. People are free to strike the bell, do take the opportunity to do so with a prayer if possible. The peace bell was done by artist Masahiko Katori. According to the artist, you need to stand directly under the bell to appreciate his work. The park is located in the busy commercial district, it contains a museum and monuments dedicated to those killed by the explosion. You will also find the iconic Atomic Bomb Dome, only the skeletal ruin left now, it was a former Hiroshima Prefectural Industrial Promotion Hall. The skeletal remains of the building were preserved as a memorial of the bombing and a symbol of peace. Some locals actually wanted it to be torn down. What is left after the bombing is the metal dome framework at its apex. What amazed me the most is the building did not get destroyed after the bombing. This brilliant building was originally designed by the Czech architect Jan Letzel. The design included a distinctive dome at the highest part of the building, use for Hiroshima Prefectural Industrial Promotion Hall. Made from three twisted iron pillars, the tower symbolizes the hands of the Hiroshima citizens, united in prayer for endless peace, and these hands are holding the 2 meters-diameter clock, which symbolizes the people of the world. The clock is still running the correct time. The Peace Clock is a 20 meters tall tower designed by Shoji Ohata and built in 1967 by the Hiroshima Rijo Lions Club. At one edge of the park is the Zero Milestone of Hiroshima Prefecture which its plaque describes as what once was “the intersection of main overland traffic routes” and “the main stop in water transport on the Ota River and formed the center of the Hiroshima Castle town”. This monument was built to commemorate the students who had been mobilized to make up the labor shortage in Hiroshima. Many of these were killed by the bomb. This tower was built by the bereaved parents. The wall show pictures of students being mobilized to work and make up the labor shortage after the bombing. These colorful paper cranes origami have become a symbol of hope and healing during challenging times. This statue here was built by the schools in Japan dedicated to sick children who suffered from nuclear radiation. School children will bring folded origami cranes and place them here. It was believed by folding origami one is expect to survive from the illness and get recover. Artwork by kindergarten Children showing “heiwa” meaning peace. Hiroshima Peace Park has a lot of monuments and each represents something; victim of the war and tribute to peace. Take time to walk around and spend time at the different memorial sites in the park. It is the most important place to visit in Hiroshima to learn about history. You need an hour to two to spend in this park. The Peace Memorial Museum is also located nearby and worth a visit. But if you are bringing younger children, you may want to give the museum a miss as there are many war photos and video which could be hard to handle for younger children. Places of memory that must always be kept in the heart and known. Suggestive. Thanks for your kind comment. This is one of the important attraction in Hiroshima. Thank you so much for sharing this place and the history behind it. In the States, we learn about the bombings, but it’s only in a factual capacity. We don’t learn about the true fallout. It is kind of sad to learn about the true fallout. I guess American is lucky because only the American drop bombs to other countries. LOL. By the way, this is the first atomic nuclear bomb dropped in human history, the second atomic bomb was dropped a few days later – at Nagasaki in Kyushu Island Japan. The only two atomic nuclear bombs dropped in human history. Anyway, we do not hope for any war happen again. Amen. How interesting. I do love a good history lesson and I can’t say i knew much about this. I love learning about history! You are right and it was only happened 70 years ago. I can only imagine the energy coursing through that place. It’s crazy to think of what happened there and all the lives lost. It is sad but we learn from the history and not to repeat. A humbling experience indeed…thank you for sharing your trip with us! thank you for sharing with us that side of the world. we only learn new things through reading and by being present there. but you were able show us the beauty of the place through your narratives. I love visiting places that have such a rich history like that. It’s so important. Sounds like this was a very impactful visit. The Memorial Tower would be something impossible to forget. Thanks for sharing this with us. The top part of the building built by the Czech architect is still surviving now, after the nuclear bomb. Pretty amazing. I can only begin to imagine how sobering the experience was. So much emotion and history to be found in that place. Such rich history, yet so sobering at the same time. The Atomic Bomb Dome evokes real emotion for the amount of human suffering. I totally agree with you, pretty sad to see only parts of the ruins. The government did some restoration to make the building stay firm and steady, as it may collapse any time when there is an earthquake. Thank you so much for writing this blog post and educating all of us about the history. Oh that would be such a sobering experience indeed. I am sure it is filled with lots of interesting historical sites, but I hope it always become a place to remind us to live in peace. Even after all these years, the Hiroshima bomb is still shocking. It’s so good to see the peace park and eerie to see those structures. Let’s pray it never happens again. The park looks beautiful! But I wish there was no need for such parks. Nice reading your experience in Hiroshima. This place makes me pensive all the time and reminds us that a few human beings will be the ones who will wipe the whole population out of earth. I can imagine how emotional being there was. So much previous tragedy there. Very emotional indeed. You won’t feel it if you are just walking around the peace memorial park. You feel it more when you are visiting the war museum nearby. I love how you captured every moment, your photos are beautiful. There are some entertainers singing in the peace memorial park too. Well, I guess it is a place to relax and have some happy vibes too. This is a place to learn about the past, the war, the nuclear bomb. A great place for history lesson I guess. Oh wow! Such a great place to visit with kids. I love to see this in person and take the experience as like as yours. Bring along children and let them expose to history lesson and get interested in history and score A. LOL. Wow – that looks like an amazing place to visit. I bet you’ll never forget it. It was my second visit to this place. My first visit was during my University year. I don’t think I can forget this place. We learned what happened to this place through our history books. I didn’t even know what it looks like until now. Thanks for this awesome shots. Hiroshima city look pretty different from other parts of Japan, you feel the whole city is pretty modern and new. This is because all the old buildings were being destroyed by the Nuclear bomb during World War II. That looks like a mesmerizing park to visit. I will definitely put this on my next travel lists. I love visiting historical place like this. You get to learn a lot from places like this, is real and only happen 70 years ago. There is a war museum nearby and really worth to pay a visit. Upon entering the museum, there is war simulation which can be quite real for you to experience.